Earlier this year, the Norwegian Parliament announced it has adopted a resolution to halt emissions from cruise ships and ferries in the Norwegian world heritage fjords as soon as technically possible, and no later than 2026. Operators must conform, and this is resulting in a scramble towards battery and hybrid diesel-electric power as a standard means of propulsion. The development of battery ferries in Norway is expected to drive similar developments in the ferry sector further afield. Siemens is opening a fully automated and digitalised plant in Norway in Q3 2018 that will develop and manufacture energy storage technologies for both marine and offshore oil and gas applications. The company has been at the forefront of developing electric propulsion and battery technology for the ferry industry. It provided the propulsion and battery solution for Ampere in 2015, the world’s first fully battery-powered car ferry. Mr Sole-Gärtner said the solution was based on technology Siemens had developed for the offshore industry. With the change from diesel propulsion to battery, Norwegian shipowner Norled has reduced the cost of fuel by 60% on Ampere. Other recent contracts include two new battery-powered ferries for Fjord1 (announced in 2016) and the electric solution for FinFerries’ battery-powered car ferry Elektra, delivered last year. Most prominently, Siemens is providing the electric propulsion and energy storage solution, management and automation for Color Line’s new battery-diesel hybrid vessel, which will be the largest battery-hybrid plug-in ferry in the world when delivered next year. Siemens is using its BlueDrive PlusC propulsion system and the new BlueVault lithium-ion energy storage solution, which aims to reduce emissions and risk for offshore and marine deployment. Mr Sole-Gärtner said “One advantage is that it allows integration of the energy storage system in an efficient way without a lot of equipment.” The system uses a direct current rather than an alternating current, which makes it “fit for purpose for use with a battery system” and it works more efficiently with a battery system compared to an alternating system. One challenge Siemens must overcome in the installation is the sheer size of Color Hybrid. “The propulsion system and batteries are larger than those usually deployed in a ferry, but the technology is scalable, so it can meet different needs and be used across small and large ferries,” explained Mr Sole-Gärtner. An increasing number of newbuilds using diesel-electric propulsion are being announced. In July this year Remontowa Shipbuilding signed a contract to construct two double-ended hybrid ferries for Norled. The new ferries will be equipped with a diesel-electric hybrid system. The shipyard explained that in normal operation the required power will be taken from two battery packs installed on board. The batteries will be recharged from the land grid during the vessels’ stay at quay, which will typically be about 11 minutes. Remontowa added that a fast charging solution of pantograph or plug-in type will be used to ensure the required state of charge of the batteries is maintained. The shore charging system will be integrated with an automatic mooring system of vacuum or magnetic type, holding the ferries when at quay and giving the ‘green light’ for the charging process to start. The intention is to use the generating sets the vessels will be equipped with, running on 100% biodiesel, only in case of emergency. The electric system will be prepared to operate them alongside batteries. The new ferries will service the Festøya-Solavågen connection. They will be capable of carrying up to 120 cars and 296 passengers. 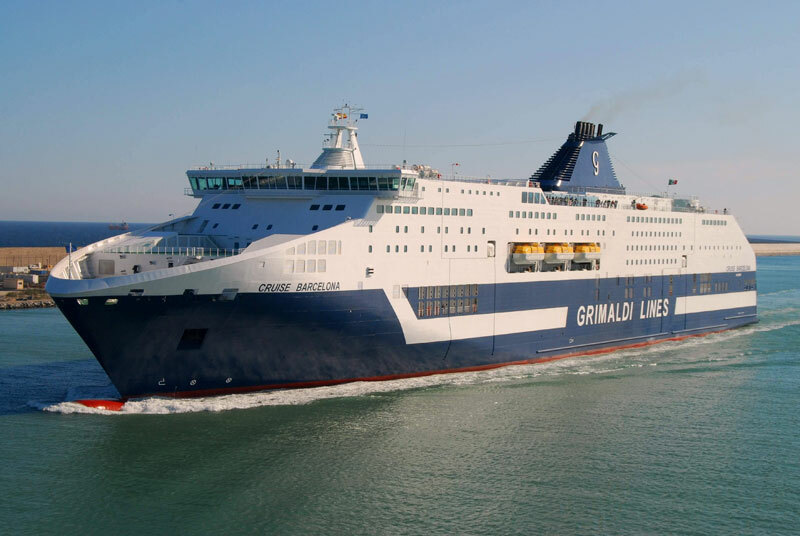 Grimaldi is lengthening two ropax ferries to create space for installing batteries to convert the vessels from diesel-powered to diesel-hybrid. The project is a first-of-its-kind, as it is the first time batteries have been installed in the extension of a ferry. The lengthening will also create extra cabins and public spaces. Grimaldi signed a letter of intent with Fincantieri in March 2018 for the shipyard to undertake the lengthening and extensive refurbishment of cruise ferries Cruise Roma and Cruise Barcelona, built by the Italian yard in 2007 and 2008 respectively. Two 28-m long sections will be fitted to the mid bodies of the ropax ferries. Before lengthening, the vessels’ statistics are: 54,000 gt, 225 m long, 3,000 passengers, with a 2,400-m2 car deck and 3,000 lane metres for heavy vehicles. After lengthening: 63,000 gt, 254 m long, 3,500 passengers, 3,400 m2 car deck and 3,700 lane metres for heavy vehicles. Fincantieri will kick off the work at the start of January 2019 on Cruise Roma, with work expected to take 12 weeks. It will be followed by the lengthening of Cruise Barcelona. Fincantieri’s ship repair and conversion division will carry out the project at its Palermo site. Commenting on the reasons behind the lengthening, Fincantieri’s manager for the project Andrew Toso said “The reason is to increase capacity, but the ferry operator has a very environmentally friendly approach so is using this new section to install batteries. This will allow the vessel to have zero emissions in port as all of the electrical needs of the vessels will be met by the batteries, allowing all gensets to be switched off.” The batteries will be recharged while at sea. The batteries will total 5 MW of installed power and will be supplied by Corvus Energy. Mr Toso explained there will be two battery rooms and “due to space and battery weight” the battery pack will be spilt into two, with one half in the battery room port side and the other in the room on the starboard side.